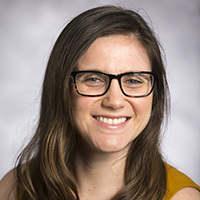 Valerie Chertin, MS, RD, LD, is a Registered Dietitian licensed in the state of Georgia. Ms. Chertin has a holistic approach to patient care, using the most current evidence based practice and individualizing recommendations for each patient. Prior to working at Winship, she worked as an in-patient dietitian at Atlanta Medical Center. Ms. Chertin graduated from Emory University with a Bachelor of Science in Anthropology and Human Biology. She completed her Masters in Science in Food and Nutrition at the University of Georgia and her dietetic internship at Southern Regional Medical Center.